The lobby at Palmer House Hilton. 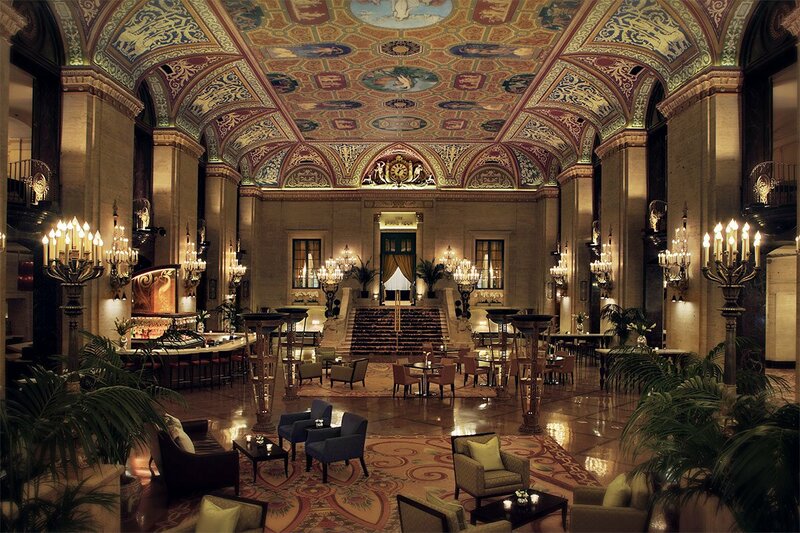 Photo courtesy of Palmer House Hilton. We have a soft spot for history tours, especially when they start and end at gilded 19th-century hotels. CHICAGO – I travel for stories that local people, buildings, and food have to share. 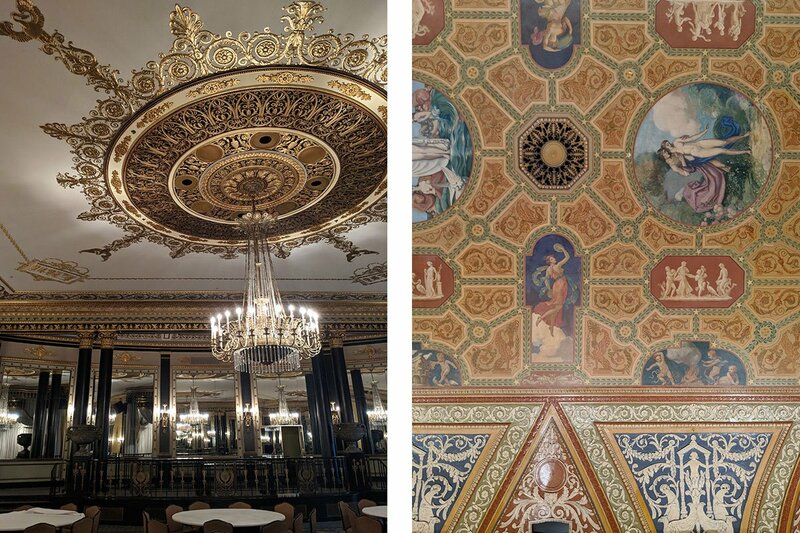 A recent tour of Palmer House Hilton, the oldest hotel in Chicago, delivered on all three. The History is Hott tour, led by resident historian Ken Price, started in the hotel’s museum, a tiny room tucked away on the mezzanine level. 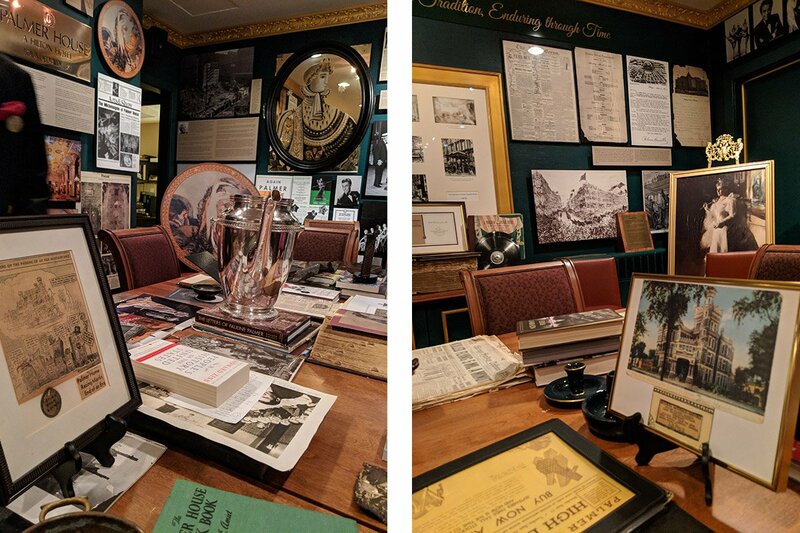 Every available surface was covered with hotel memorabilia: black-and-white photos, newspaper clippings, old menus, painted portraits, and the priceless artifacts that Price has amassed in 32 years studying the hotel’s 140-plus-year history. This is where Price introduced us to Potter Palmer, the son of a humble cloth tradesman from Albany, New York. Armed with a fourth-grade education and his father’s life savings, Palmer moved west to a swampy town ("Chicago" is translation of “shikaakwa,” the Miami-Illinois word for “smelly onion”) in the middle of America to make a name for himself. The hotel museum. Photos by Becky Cheang. In 1871, Palmer gave his new wife, Bertha Honoré, the world’s best wedding gift: the Palmer House hotel. It was also the world’s shortest-lived wedding present: The building burned down thirteen days after their wedding in the Great Chicago Fire. With Bertha’s encouragement — and a $1.7 million loan — Palmer constructed a second hotel across the street from the original. Opened in 1873, the new Palmer House was a pioneer for its many architectural and engineering feats. Advertised as the world’s first fireproof hotel, the building also had the city’s first elevators — paving way for the many skyscrapers that now make up Chicago’s iconic skyline. Ceiling details. Photos by Becky Cheang. Bertha Honoré Palmer was no wallflower. One of the few women at the time to receive a university education, she became one of Chicago’s most influential women. In 1893, Bertha was appointed head of the Board of Lady Managers for the World’s Columbian Exposition. An early feminist, she hired one of America’s first licensed female architect, Sophia Hayden, to design the women’s building. Bertha was also an avid collector of French Impressionist paintings. She later donated almost all of them to Art Institute of Chicago, making the museum home to one of the world’s most important Impressionist collections outside France. The Red Lacquer Room. Photo courtesy of Palmer House Hilton. After the introduction to the illustrious couple, we toured the hotel’s public spaces. We marveled at the breathtaking ceiling fresco and the 24-karat gold Tiffany chandeliers in the lobby. We climbed the grand staircase into the Empire Room, which in its heyday hosted some of entertainment’s best, including Frank Sinatra, Judy Garland, and Louis Armstrong. 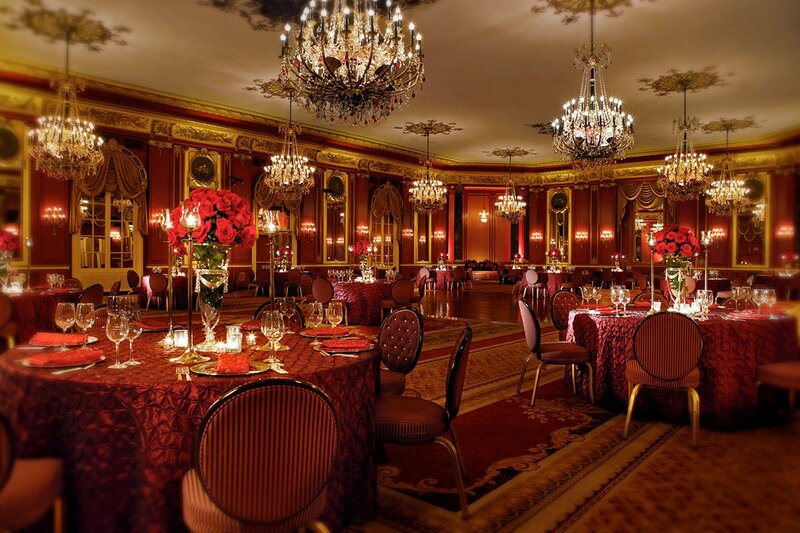 We stepped into the grand ballroom — Mark Twain gave his famous 2 a.m. speech here at the welcome back party for General Ulysses S. Grant in 1879 — and the opulent Red Lacquer Room, complete with garnet-draped chandeliers. At the end of the tour, I was full of history and delicious brownies. Ken Price sent us on our way to the nearby Art Institute of Chicago to look for the Palmer’s donated pieces and marble busts of the couple. Tickets include a prix-fixe lunch at Lockwood and a History is Hott tour with Ken Price. Tours begin at noon Tuesday through Saturday. Click here for reservations. Palmer House, a Hilton hotel, is located in the middle of downtown Chicago, a block away from the Millennium Park crowds. Look out for the stunning marquee on the East Monroe Street entrance. Not to give away any spoilers, but you'll want to have you phone out when you emerge from the escalators / staircase into the opulent lobby. Such a stunning ceiling fresco. So much gold. The executive suites at the hotel have their own private elevator banks, and if you're the type that's looking to avoid as much human interactions as possible (why?? ), download and join the Hilton Honors program to check in and out and to get your digital keys through the app.